1 of 5 In 5- to 5-1/2-quart slow cooker, layer the chopped onion, pork roast and sweet peppers. In a medium-size bowl, stir together the tomatoes, cumin, garlic salt, oregano and cayenne pepper. Pour evenly over the mixture in the slow cooker. Add chiles and corn. 2 of 5 Cover slow cooker; cook on high heat for 5 hours. Remove pork roast to cutting board; keep warm. 3 of 5 Remove 1 1/2 cups liquid from pot and discard. Stir the tomato paste into the vegetable mixture in the slow cooker. Cover; cook for another 30 minutes. 4 of 5 Cut the pork roast into slices. Shred the slices using 2 forks to pull the meat apart. Add the shredded pork to mixture in the slow cooker; heat through. 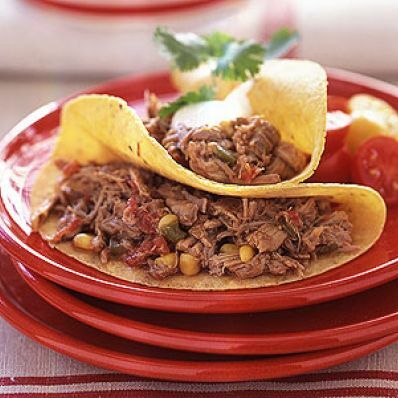 5 of 5 To serve, wrap the pork mixture in the warmed corn tortillas, dividing the mixture equally among the tortillas. Garnish each serving with fresh cilantro leaves and sour cream, if desired.